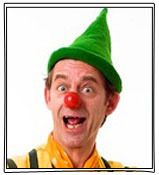 Tim the Skinny Clown is a hilariously funny fool who starts his party in fine style with a 45 minute comedy clown show. He will have the children joining in and laughing their smelly socks off as he tries to sleep on his collapsing chair, unstick his skinny sticks, spin his spinny plates, or walk the dangerous walk of doom while juggling his razor sharp clubs. 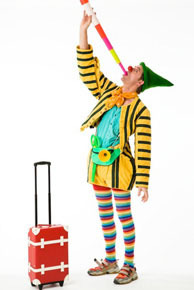 He also makes brilliant balloon models and teaches circus tricks, all accompanied by his own sound system. 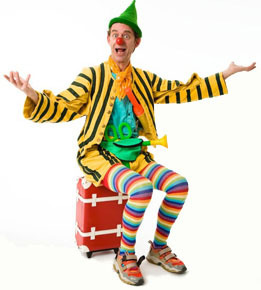 With a cool combination of circus skills, magic and clowning, Skinny Bean is sure to be a hit with all the children. Tim is based in London. "Hi Sue, here is a small note of appreciation for recommending Tim for our son's first birthday. He was fabulous. 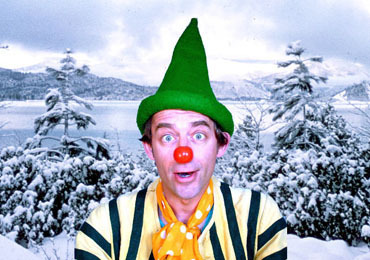 All the children loved his show and the adults enjoyed it no less. He involved all the kids with his show and made it quite interactive which made it all the more interesting for the kids.There has already been enquiries about him and your network and obviously I have no hesitation in recommending it to them. I hope you will be happy with this. Once again, thanks to Tim and yourself, its been a memorable party. Regards, Vikram"
"Hi Susannah. Would just like to thank you for your help in booking Tim. He was fantastic and the kids loved him. I will definitely be using you guys again when my next son turns 5 and I'm glad to say you should be getting contacted soon by some of the parents who wish to book Tim for they kids party's. Regards, Kevin"